Maybe It's You picks up where You Are a Badass leaves off--it's a no-nonsense, practical manual to help readers figure out not just what they want out of life, but how to actually get there. Featuring a foreword from #1 New York Times bestselling author Mark Hyman. 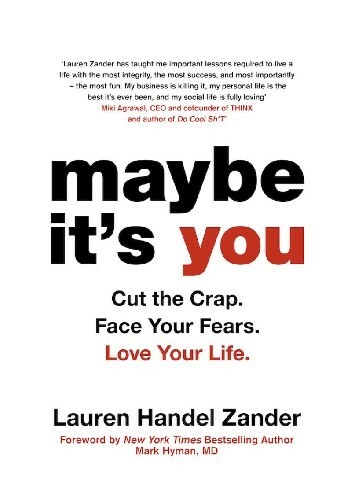 In Maybe It's You, life coach Lauren Handel Zander walks readers through the innovative step-by-step process that has transformed the lives of tens of thousands of her clients, and explains how anyone can achieve amazing things when we stop lying and finally start keeping the promises we make to ourselves. Whether readers want to find love, succeed at work, fix a fractured relationship, or lose weight, Zander's method will offer a road map to finally get there. Filled with practical exercises, inspiring client stories, and Lauren's own hard-won lessons, this book enables readers to identify, articulate, and account for their own setbacks so they can transform them into strengths. Actual steps to drastically change your life that works. One of the best books on the topic I've ever read. It's a must-read for those who want something more from their day to day existence.